While reams of research have been done on why members of the Millennial generation are less likely to own a home compared to their baby boomer and Gen X elders at the same age, the Urban Institute (UI) notes that knowing the reasons doesn't necessarily shed much light on the potential long-term implications of this behavior. Delaying homeownership, according to UI analysts Jung Hyun Choi and Laurie Goodman, may reduce the wealth the generations' members will acquire over their lifetime. Goodman and Choi used a dataset called the Panel Study of Income Dynamics (PSID) which has tracked individuals since 1968 to identify individuals who reached age 60 between 2003 and 2015 and gather information on their histories, including the age at which they bought their first homes. Half of the older adults in the sample became first-time homebuyers between 25 and 34 and 27 percent bought before age 25. However, among today's younger age groups only 37 percent of those age 25 to 34 and 13 percent of those 18 to 24 owned a home in 2016. The authors found that buying at an early age gives those that do so "a big bang for their housing buck." 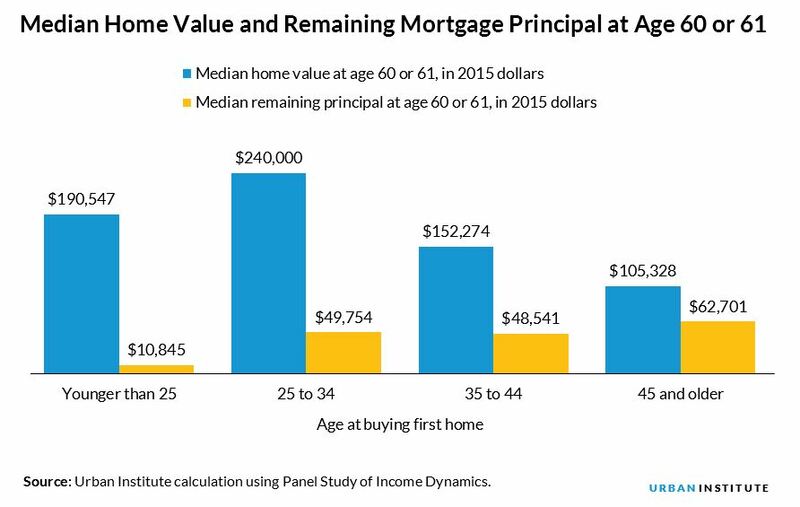 Individuals who made their first venture into homeownership between ages of 25 and 34 had median housing wealth in their early 60s of $150,000 while those who waiting until they were 35 to 44 accumulated $72,000 less. Those who didn't buy until their 45th birthday or later accumulated median wealth at least $100,000 less than those in the 25 to 34 age group. Yet, those who bought very young, before they turned 25, ended up with only the second largest amount of equity, a median of $130,000. UI attributed this to the group having lower incomes and less education. At age of first purchase only 19 percent of this group had obtained a college education compared to more than 50 percent of those in the other three groups. Their income was a median of $53,000 (in $2015 dollars), but the pattern here was less clear. The group with the highest income, $70,000 was in that second youngest group while median incomes declined for the two older groups. Among the oldest buyers it was only $7,000 higher than among the youngest. The youngest group also purchased less expensive first homes; a median under $70,000 (2015 dollars), while the median first-home value was around $125,000 for the other three groups. 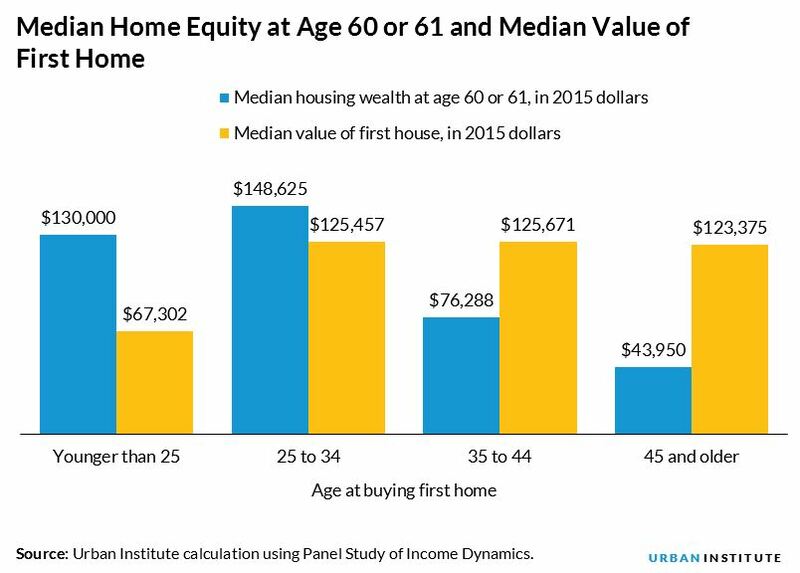 Those buying before reaching age 25 may have ended up with less median housing wealth than the second youngest group, but they still got the largest return on their initial investment. The ratio between the median home equity at age 60 or 61 and median price of the first home decreases with the first age of homebuying: the ratio is highest for those who bought their first home before age 25 (1.93) and the lowest for those who bought their first homes after age 44 (0.36). The different in housing wealth among age groups came both from home price appreciation and from paying down their mortgage debt. 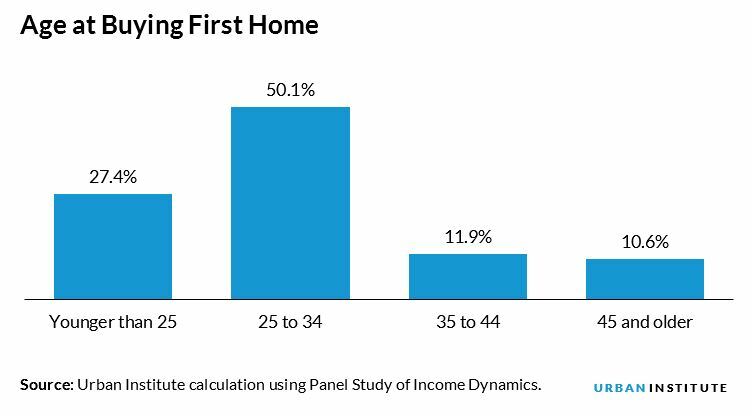 The group that bought their first home between ages 25 and 34 live in more expensive homes in their 60s, a median of $250,000 than those who bought both earlier and later. The youngest buyers live in houses of lower value, which may be attributed to their lower education levels, but also have less mortgage debt due to their home tenure, a median less than $11,000, considerably lower than the other three groups. The UI researchers conclude that the age at which persons buy their first home has a great deal to do with housing related wealth as they approach retirement. Thus, the Millennials' delay could have long-term economic consequences for their future and for the nation's economic well-being as they fail to build equity, the largest single source of personal wealth, at the same rate as previous generations. The authors conclude that "While people make the choice to own or rent that suits them at a given point, maybe more young adults should take into account the long-term consequences of renting when homeownership is an option."